I was so tired of my vanity being a scattered disaster that I decided to start taking five minutes each week and doing little organizing projects to make my morning and evening routine a bit more timely with the added benefit of a beautiful space. This weeks project is a Glass Makeup Brush Holder with beautiful sea glass. I am happy to announce this simple makeup brush organizer was so easy to make! 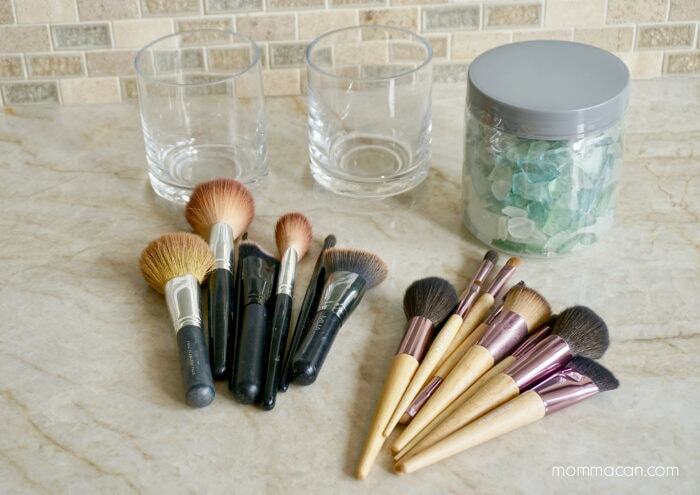 This Glass Makeup Brush Holder is part of our new category series on Simple and Easy organizing hacks for busy moms! The project is super simple, the biggest time burner was the shopping, but hey, I love shopping for pretty containers! Two Glass Candle Holders – Wide enough for pillar candles and heavy enough not to topple over. Sea Glass – Enough to fill a 1/3 of each container. Makeup brushes vary, but the pretty wood handle brushes are from Target. Directions: Clean glass jars with dish soap and warm water, dry thoroughly. Rinse sea glass in a colander. Fill Glass jars 1/3 full with sea glass. Place brushes handle side down, this is so you don’t end up with any sea glass particles on your brushes. I love the elegant sea glass against the warm beach colored tiles in our bathroom. I especially loved the jars sitting on the beautiful cake plate to add dimension to space as pictured above. I hope you enjoyed our 5 -Minute organizing break. If you love this organizing tip try our out Carafe Mouthwash Dispenser Post, simple and pretty. thank you! I had so much fun creating somthing even with my busy schedule. So pretty! The sea glass definitely adds a nice touch. What a cute and clever idea. I’ve got plenty of glasses that are never used. I mean how many do we really need. And that idea looks so fresh with the glass inside the glass. Simple and elegant! That’s the way to go, great job, Pam! This is a great idea ! 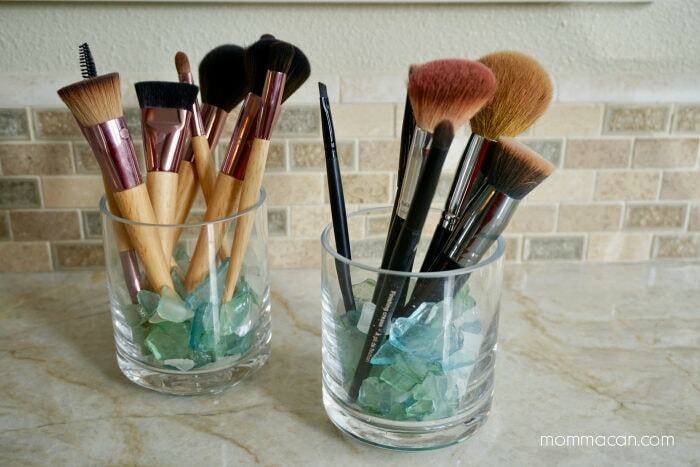 I have my brushes in glass jar containers, but have not considered adding glass pieces – a very pretty touch! I did something similar and I love having all the brushes out where I can see them. Nice job with the sea glass, I love the colors. Sea Glass is a theme in our master bath. I am slowly going around the room and making it pretty. Would love to see yours!